Before using sequins to embellish anything in sight, it is important to realize how to best use these small details without overdoing the sparkle. Sequins, also called diamantes or spangles, are disk-shaped, flattened beads frequently used to embellish clothing and costumes. However, sequins have historically served a much more practical purpose. 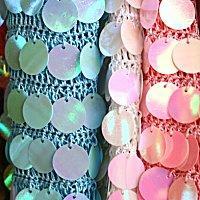 In the Mediterranean and Middle East, where using sequins originated, the colorful disks were initially coins. Attached to a woman's clothing, they displayed the family's wealth and contributed to the woman's status. In fact, the origin of the word sequin can be found in sikka, the Arabic word for coin. This was translated to zecchin in Italian and then to sequin in French, which is the form eventually adopted into English. Today, sequins are no longer coins, but using them sparingly and with good taste can add richness to many projects. 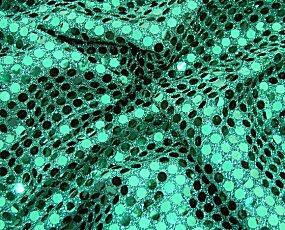 There are numerous sequin sizes available, from two to 30 millimeters in diameter. While most styles are flat or slightly curved, others are faceted to reflect more light in different directions. By far the most popular shape is round, but other shapes include octagons, hexagons, stars, hearts, leaves, snowflakes, flowers, and starbursts. Other sequin characteristics include different finishes on either side to create greater depth and texture to a project and a multitude of colors, including opalescent and iridescent sheens as well as clear varieties. Ready-made sequin trims are great options for elaborate projects, eliminating much of the tedious labor of attaching thousands of tiny accents to a project. With careful use, there is no limit to the projects sequins can enhance. Gaps in densely concentrated sequins are inevitable; focus on creating a nice project rather than perfection. Apply sequins in whatever way keeps them securely attached: glue for paper crafts or flat fabric projects, pins when attached to styrofoam shapes, or sewn onto fabric projects as trim. Attach disks securely to keep them in place, or attach loosely to encourage turning and glittering with movement such as on clothing or costumes. When choosing the sequins for a project, consider the durability of the item and opt for sequins by-the-yard if the item may be frequently stressed. Choose metallic finish sequins if reflecting light is the desired result, such as for a dance costume or other performance outfit. Opt for small quantities of sequins initially and add more only after careful consideration to avoid a too glitzy or showy result. There are many types of sequin embellishments to choose from, and using sequins in a variety of craft projects can add sparkle and glitter to the finished item. If chosen carefully and used cautiously, sequins can be a charming and fun embellishment to many projects.